kept it very basic and super simple. The soup turned out fabulous and it is a very flexible kind of soup. I hope you enjoy it because I sure did. In stock pot, saute the carrots, celery, onion. garlic for 5 to 8 minutes to soften the vegetables. 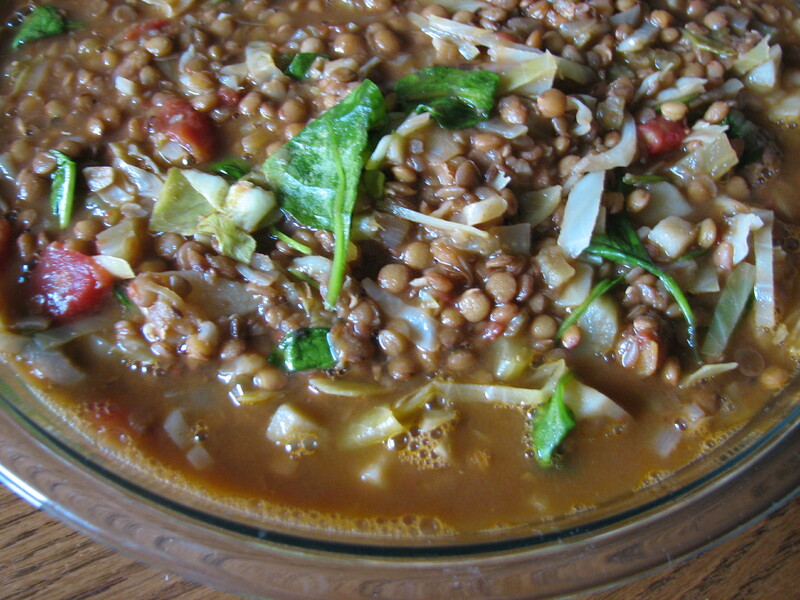 Add the lentils, bay leaf, salt, pepper, and broth. Bring to a boil and reduce to simmer for at least 15 minutes. Add the potatoes and cook for another 15 minutes. The lentils and potatoes should be cooked through. Add the kale and cook for another ten minutes. Toppings: Add grated cheese of choice, gluten free chicken sausages all optional. It’s a new year. 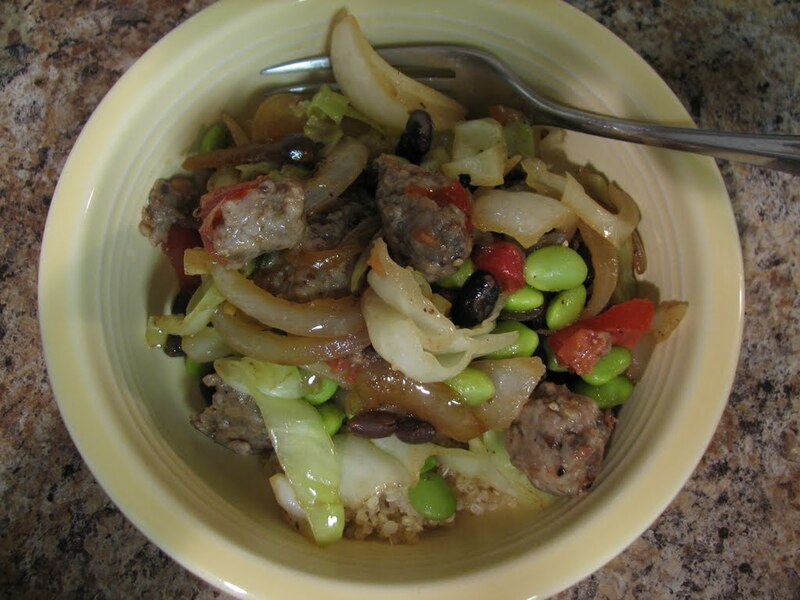 Simply Healthy Cooking with Pam has been going strong since December 30, 2009. I cannot believe that I passed the 4 year mark. Lots of changes and learned so much about food. I have been slowly changing my food diet to reflect more vegetarian / vegan recipes. I am experimenting with different kinds of soups this month. I have a cookbook I use frequently called “The Big Book of Vegetarian” by Kathy Farrell-Kingsley. This book has lots of good recipes that are very filling and hearty. I highly recommend it. This soup is really creamy without any dairy use at all. Everything in this soup is vegetable. This soup is amazing when all ingredients are summer fresh straight from the garden or farmer’s market. I tweaked the original recipe to the ingredients I had on hand. Enjoy. In a large soup pot, warm the oil or vegetable broth and add the carrots, celery, onion, green onions and cook until softened, about 10 minutes. Stir often. Add the corn, potatoes, broth, and basil. Bring the soup to a simmer over medium-high heat. Reduce the heat to medium-low, cover, and simmer until the potatoes are cooked and the vegetable broth has reduced to just barely covering the cooked vegetables. Add the chopped fresh dill. Ladle the soup to a blender or food processor in batches, be careful when process because the soup is very hot and can spurt up from top of blender or food processor. Process the soup until desired consistency but has some chunks of vegetables. Return to the soup pot and season with salt and pepper. The weather has changed to cool fall weather. I have been doing a lot of research on different kinds of soups. I am slowly changing my diet to reflect more of a vegetarian way of eating because I am noticing that I am not as tired and do not have heartburn or digestive problems when I eat vegetarian. I still do love meat and cheese I hope that as I change more to a much healthier diet I will not crave meat, eggs and cheese so much. I think this will be a work in progress. I did some research on Peasant Soup and found meat, vegetarian, and vegan ways appealing so I combined many resources and created my own. I think with the research I did, I discovered that everyone has their own version of vegetables, meats and spices. I would like to say I have adapted a really good vegan recipe. Next time I will add carrots to the soup. The smells in the apartment were heavenly and the soup came out really hearty, loaded with flavor, and very filling. Enjoy! 1 small bag 12 oz of Lentils rinsed and picked over well check for stones, twigs, etc. In a stockpot, heat up the olive oil on medium high heat and add the chopped onions and celery. Cook for about 5 minutes till onions become soft and somewhat brown. Add the garlic and stir for about a minute or so. Do not let the garlic burn as it will make the recipe taste funny. Add the caraway seed, thyme, and basil to the onion/celery/garlic mixture. Cook for about another minute stirring often. Add the water, bouillon, bay leaves, tomatoes, lentils, and potatoes to the stockpot. Stir and let come to a boil. Then turn down to heat to simmer and cook for about an hour or until the potatoes are soft. Add the cabbage the last 10 minutes of cooking. Remove from heat and add the baby spinach. Cover and the steam will wilt the spinach after about a couple of minutes. Stir again and season with salt and pepper. Serve with whole grain or rye crusty bread. Note: For the meat lovers, need to remove the Caraway Seed (optional) and add a type of sausage or cubed chicken breasts to the soup. Just remember if using linked sausage of any kind, remove the casing. I am sure the flavors will change when adding a protein to the soup. The results will probably be the same – delicious, filling and hearty. This recipe I saw on Rachel Ray’s website but I tweaked it to a healthier version and added turkey kielbasa. I had purchased some pie pumpkins from a local farmer’s market and decided to roast them. I had some pumpkin puree left over and made the soup for the first time. It was delicious. Now when I am pressed for time and cannot roast pie pumpkins, I purchase organic pumpkin puree. This happens to be one of my favorite soups that I make quite a bit in the fall and the wintertime. 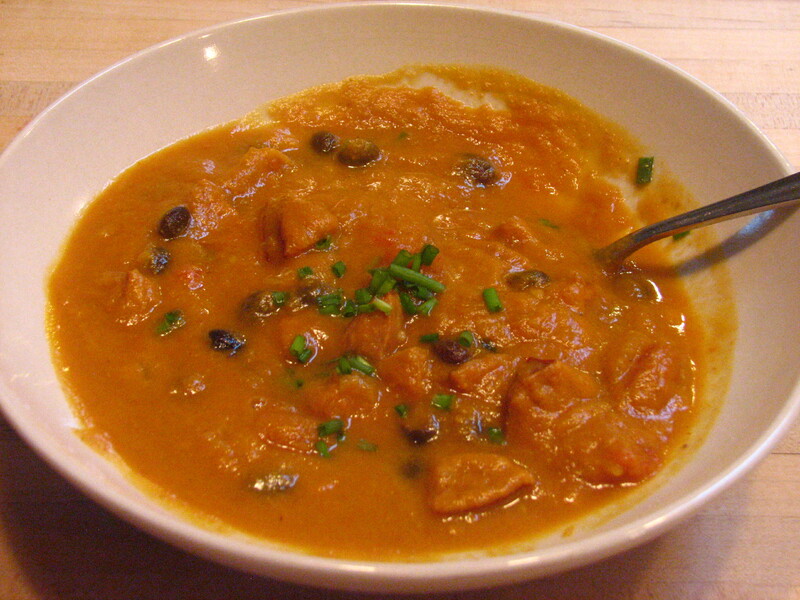 The soup freezes well and it is good with a green salad or crusty toasted bread and butter. Enjoy! Heat a stockpot over medium heat and add the oil. 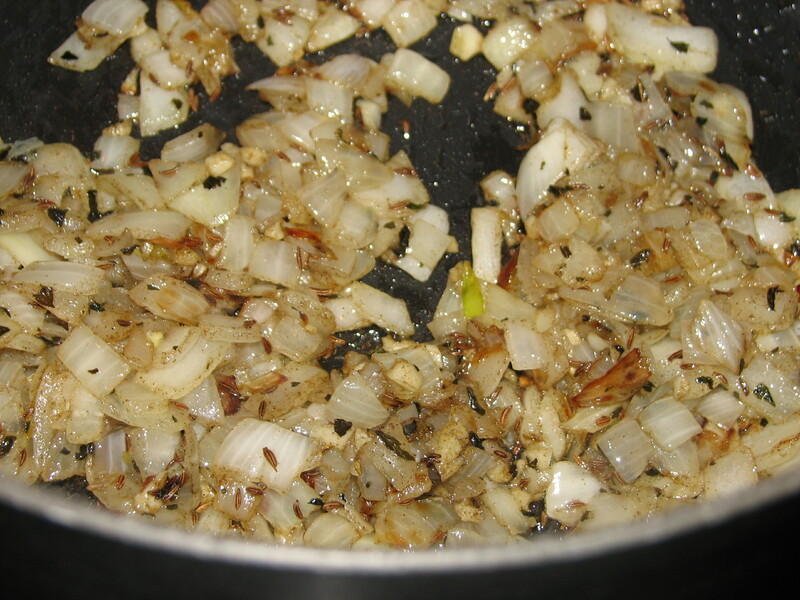 When the oil is hot, add the chopped onions. Sauté the onions for about 5 minutes and add the vegetable broth, tomatoes, black beans, pumpkin puree, and turkey kielbasa. Stir well and bring mixture to a boil. Reduce heat to medium low and stir in cream (optional), curry, cumin, cayenne pepper (optional), salt and pepper. Simmer for additional 5 minutes. Adjust seasonings to your taste and serve with chives sprinkled on top. The weather is turning colder and the leaves have turned into soft vibrant shades of gold, red and oranges. Frost has appeared on my car window this morning and I thought this is the perfect day for soup. I put a pot of navy beans on the stove to cook in the middle of the week and had the rest of the ingredients on hand. 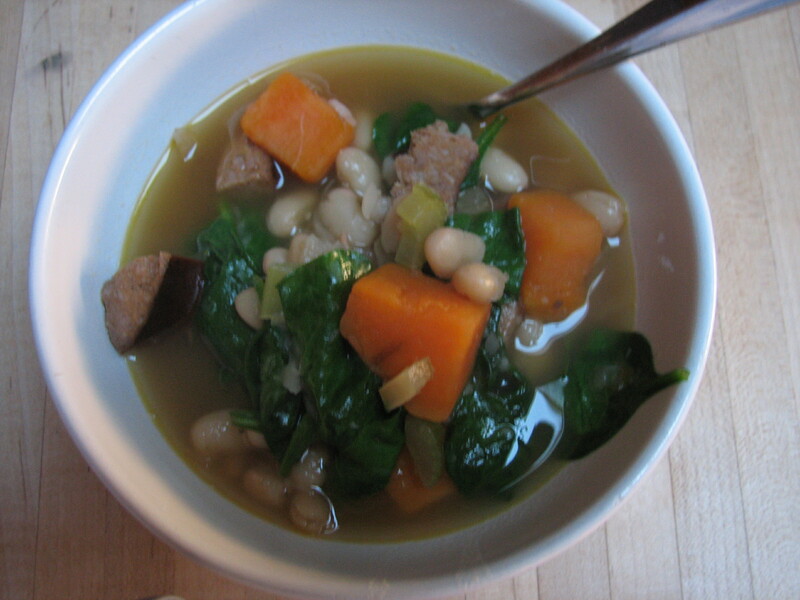 I thought how do I make a healthy and satisfying soup that is not loaded in calories. I hope you enjoy the soup as much as my company and I did. The soup was a hit and I plan to make it often. Preparation for the Navy Beans – this can be done earlier or on the same day. Most recipes explain the beans should be soaked overnight. I did not do that this time and the beans were fine. In a large stockpot, heat up the olive oil, add the red onion, and cook for about 5 minutes or until the onions are semi-soft and lightly browned. Add the water, sweet potatoes, turkey kielbasa, bouillon, and cooked navy beans and bring to boil and then reduce the heat and simmer over medium low heat for about 40 minutes or until the sweet potatoes are soft but not falling apart. Remove from the heat and add the baby spinach wait a minute or two and the spinach will wilt and mesh in with the soup. This soup is one of my all-time favorites. I think that I do not make it enough and I should. 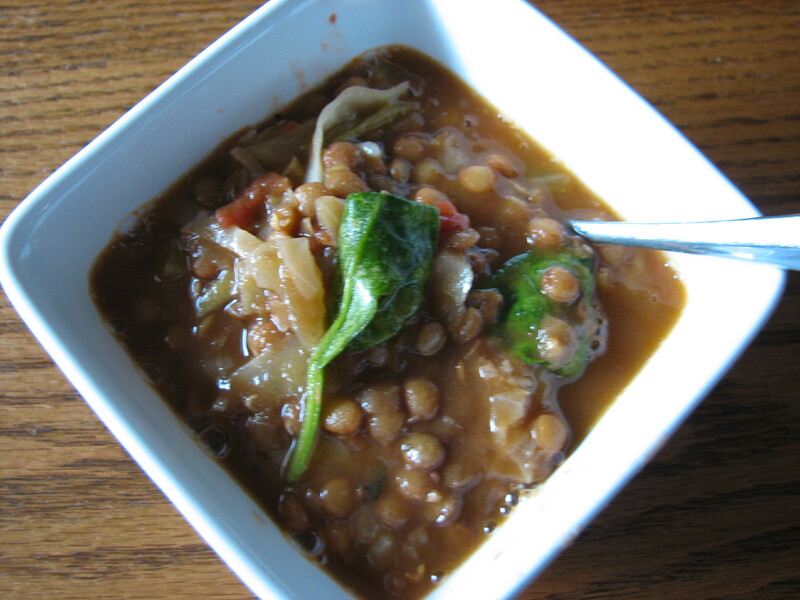 It is hearty, loaded with fiber and warms you on a cold winter day. Adding mushrooms is another bonus. How could I possibly go wrong with a soup like this? Make the sofrito (see cooking tip #2 for picture) with the carrots, celery, onion, and garlic with 2 tablespoons of olive oil in the soup pot over medium heat. Cook for about 5 minutes to get the vegetables going and the flavors to marry. Add the cleaned sliced mushrooms (see cooking tip #4 for cleaning mushrooms) to the sofrito. Stir for about 2 minutes so that the mushrooms absorb the extra oil in the bottom of the pan so the soup does not have that oily look on the top when done cooking. Add the water and choice of bouillon, bay leaf and bring to a boil. Reduce heat to simmer and cook for about 45 minutes. Add the barley, corn, lima beans, peas, thyme and wine and cook for another 45 minutes. 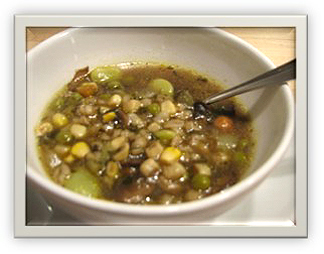 The soup will thicken and you may need to add more broth to reach the desired consistency of the soup you prefer. Flavor with salt and pepper to your taste. Note: when adding liquid you will need to taste the soup to make sure the seasonings do not need to be adjusted. For example: may need to add a splash of wine, or a ¼ teaspoon of bouillon. Serve with whole wheat croutons. See below for recipe. Enjoy! Brush olive/butter mixture over sliced bread both sides and cut into 1-1/2” cubes. Spread single layer over a cookie sheet or stone and bake in 350 degree oven for about 10 minutes until the bread becomes hard and crunchy. Cool to touch and put about 5 to 6 croutons on top of the soup. Yum! Cooking Tip: The broth I made from a product called “Better than Bouillon”. I find that it has less sodium than some of the broths and / or cubes of bouillon out on the market and I only need to use a little bit of it because the flavor goes a long way. I prepared the broth per the manufacturer’s directions. For the soup – I just added the 8 cups of water to the prepared sofrito and then added 1 to 1-1/2 teaspoons of beef and 1 to 1-1/2 teaspoons of mushroom bouillon to the water. Nutritional Tip: Barley has so many health benefits. It is a soluble fiber that may help prevent many health problems such as heart disease, high blood pressure, diabetes, obesity and many gastrointestinal disorders like Internal Bowl Syndrome (IBS) and colon cancer. The American Dietetic Association (ADA) suggests that adults should consume at least 20 to 30 grams of fiber a day and studies show that Americans consume only 50% of the required amount daily. 1/3 cup of barley consists of 0.5 grams of fat, 5 grams of dietary fiber, and only has 160 calories.